Jordyn Woods hopped on stage during Jaden's set. 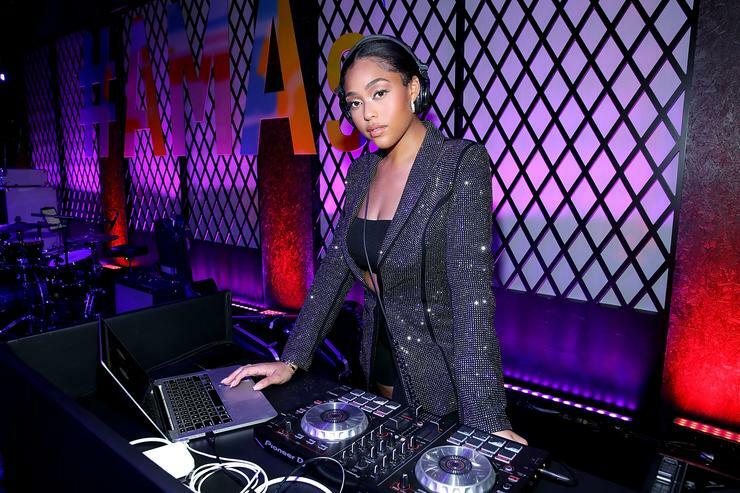 "There's no such thing as bad publicity" is an outdated saying but in the case of Jordyn Woods, it's applicable. Earlier this year, she got intertwined in some Kardashian family drama after she was accused of hooking up with Khloe's ex-boyfriend, Tristan Thompson. The Kardashian clan reportedly severed ties with her but ultimately, it seemed to benefit her. She's been securing the bag in international markets and living her best life. Most recently, she made a surprise appearance at Coachella. Jordyn Woods might not have the Kardashians but the Smith's are still riding for her. As you know, she's had a strong relationship with Will Smith and Jada Pinkett Smith's family for years which is why she appeared on Jada's Red Table Talk after the scandal broke out. She made a surprise appearance during Jaden Smith's set at Coachella, briefly popping up on stage. Jaden took a page out of Drake's book and brought a floating Tesla on stage which he stood atop of after it was descended to the stage. Jordyn hopped on stage, did a little dance and boogied on out of there. Jaden Smith also paid homage to Nipsey Hussle during his set. Afterward, he brought out his sister Willow who also performed with him and assisted him on "Icon."